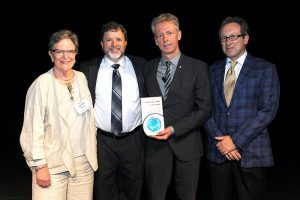 Dr. James Orbinski, former international president of Doctors Without Borders, is the recipient of the 2015 Human Security Award (presented on October 14, 2015). From Left to Right: Social Ecology Interim Dean, Carroll Seron, Division of Undergraduate Education Dean, Michael Dennin, Human Security Award Recipient, James Orbinski, UCI Blum Center Director, Richard Matthew. Photos by Rodrigo Pena Photography. Dr. Orbinski was honored for his extraordinary service and humanitarian work in war-torn regions, including Afghanistan, Rwanda, and Somalia. He served as the elected international president of Doctors Without Borders – also known as Médecins Sans Frontières (MSF) – from 1998 until 2001, during which he accepted the Nobel Peace Prize on the organization’s behalf. In his address titled, Imperfect Offering: Humanitarian Action in the 21st Century, Dr. Orbinski spoke of the Syrian refugee crisis, the role of climate change in the competition for water and arable land, and his work as co-founder of Dignitas International and the Drugs for Neglected Diseases Initiative (DNDI) – where, in 2001, they brought the market price for the treatment of AIDS down from $13,000 to less than $64 for generic versions of the same medication.